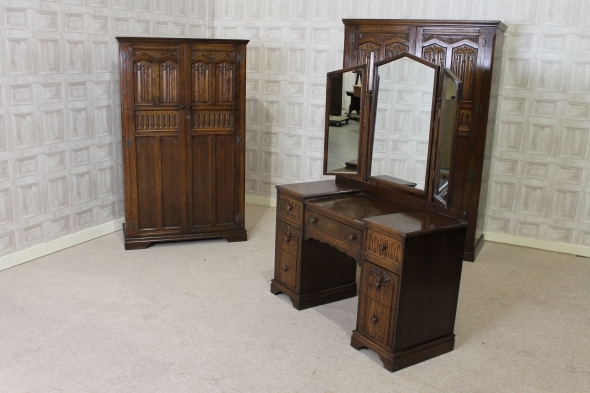 A beautiful circa 1950s three piece oak bedroom suite in a lovely Jacobean revival style, featuring excellently carved doors. The suite comprises of a gentleman’s wardrobe, a large ladies wardrobe with full length hanging and a matching dressing table. All three items are in excellent condition, and the wardrobes come with their original keys. The larger wardrobe does break down into two sections. A lovely set of furniture for any large country or period interior.